Another month, another natural skincare brand – I’m SO happy I’ve gotten to share such wonderful companies with you guys. In fact, Sigrid Natural Skin Care, today’s featured brand, actually got in touch with me because they saw my post on Jordan River Soapworks. As for Sigrid, they are a boutique skin care brand based out of the Ottawa Valley. Their simple and pure products infuse local herbs, flowers and essential oils into healing oils and beeswax for a beautifying, body-loving line-up of goods. Today, I’ve picked out five favourites for your perusal – but ohmigosh kids, I could spend hours sampling and perusing their line. First up, a product I’ve been using religiously since it came into my life. If you’re wondering whether you need an eye cream, keep in mind that the skin around your eyes is unlike any other part of your body. It’s thinner, more sensitive, and has fewer oil and water glands, so it needs more moisturization. Plus, a good eye cream can help prevent and treat wrinkles. Of course, you probably don’t want a ton of chemicals in an area that’s highly porous – so a natural product like Sigrid’s Star Bright Intensive Eye Cream is just the ticket. Featuring comfrey, chamomile and carrot seed oil to reduce puffiness and hydrate your sensitive skin, this is a must-have for any woman’s morning and bedtime skincare regime. Of all the natural care lines I’ve tried, Sigrid has best nailed the ‘body butter’ texture. Their lush lotions go on like a dream and holy are they ever fragrant – unlike most brands out there, expect to be reveling in the scent of your chosen product all day long, to the point where you can avoid spritzing on perfume. Of course, if you need a scent-free option, they’ve got just that. Also of note is their Mint Chocolate Foot Butter, which retails for the same price but is meant especially for aching, sore feet. The sweet chocolate notes are a nice complement to the traditional minty tingle that’s typical of foot creams. How cool is this? For those localvores out there, invest in this all-purpose healing salve that’s made exclusively with ingredients that are grown, harvested, or produced within 100 miles of Toronto. What does a healing salve do you ask? This multi-tasking remedy is perfect for nursing skin back to health; whether you’re dealing with a nasty sunburn or minor irritations, scrapes, or rashes, the lush oils and wax within will have your skin singing again in no time. Some people tend to be really sensitive to some of the synthetic ingredients in store-brand perfumes. If you fall in that category, an all-natural perfume still packs a heady punch (and lasts just as long, if not longer). Sigrid has three options that are easy to toss into your purse and feature potent essential oils for fresh, fragrant blends. Perfume is always a perfect choice for a friend’s birthday, or even in bridesmaid goodie bags so your gals smell sparkling fresh all day long. We put an awful lot of effort into preserving and primping something that is, essentially, dead. Of course, a glossy head of hair is an instant ticket to compliments and confidence, so why not give this intensive oil treatment a whirl? Meant for dry and damaged locks, all you have to do is rub a teaspoon of oil into your mane three times a week, let it soak into your tresses, rinse, and watch as your hair looks shinier, feels stronger, and is altogether softer. It’s a departure from any other natural beauty line I’ve spent a lot of time looking at – but your scalp deserves some tender lovin’ just as much as your skin kids. 1) Leave a comment by July 5th with a link to the Sigrid Naturals product you’d most love to try. 2) Entries are limited to one per person / per email address / per household (or more if you score bonus entries). A random draw will be conducted on or around July 6th to select the winners, who will have 48 hours to respond before another winner is chosen in their place. 4) Bonus Entry: Sigrid Naturals is on Facebook and Twitter. You know the drill – like ’em, leave a comment, link back. Or follow ’em, send a Tweet, link back. You can earn up to two bonus entries by doing either or both activities! Still looking for MORE ways to claim this prize as your own? Earn tons of bonus entries when you refer friends. Read all about it here. I would love to try http://www.sigridnaturals.com/skin-care/healing-salves/forest-girl-healing-salve Forest Girl healing Salve because I’m an outdoor gal. I’d love to try this product: Back to the Garden Body Butter. Sounds delightful! I’m hoping to try the 100 Mile Healing Sauve. I would choose Star Bright Intensive Eye Cream. I think the best products today are natural ones. The eye area is sensitive and I would love to try a natural cream to reduce puffiness and add moisture. I’d really like to try the Rose Blossom Face cream. I’d love to try the Paddler’s Salve (http://www.sigridnaturals.com/skin-care/healing-salves/paddlers-salve). My choice is the 100 Mile Healing Sauve. The name projecting what the product is about is just amazing !!! Well done Sigrid !!!! I’d love to try out the Ylang Ylang Body Butter. Definitely the body butters! Any kind!! Queen bee eye cream for sure. 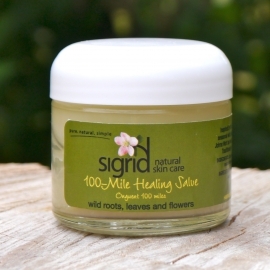 100-Mile Healing Salve is something that I would personally buy myself, I’d love to try it. I’d most like to try the 100-Mile Healing Salve! His hands are rough from all the hard work he does! 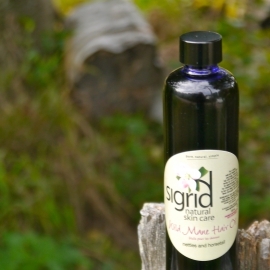 So many to choose from..ahhhh butThe Sigrid Naturals product I’d most love to try IS the …. 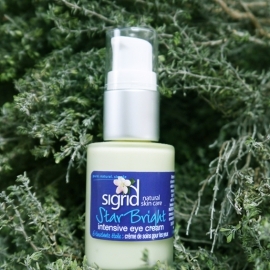 “Star Bright Intensive Eye Cream”. I have sensitive skin and this sounds beyond amazing! I don’t just want to try but need the Wild Mane Hair Oil! I want to try the Citrus Sweet Body Butter. back to the garden body cream does it for me! Love anything made from natural ingredients! Would like to try the garden body butter. Star Bright Intensive Cream, It’s all in the eyes. Natural is the best and I think you can really feel the difference when you have natural ingredients. Perfume is always a great gift, I love to change my fragrances. I’d love to try the Mint Chocolate foot butter! It sounds like it would smell wonderful! I would love to try the 100-Mile Healing Salve. I’m sensitive to the sun so I’m always breaking out in a rash during the summer. I’d like to try this cream to see if it helps. I would love to try the http://www.sigridnaturals.com/skin-care/body-butters/citrus-sunset-body-butter the most. I’d love to try the 100-Mile Healing Salve. I’d love to try the Mint Chocolate Foot Butter! I ‘like’ Sigrid Naturals on Facebook. I would like to give the eye cream a try. 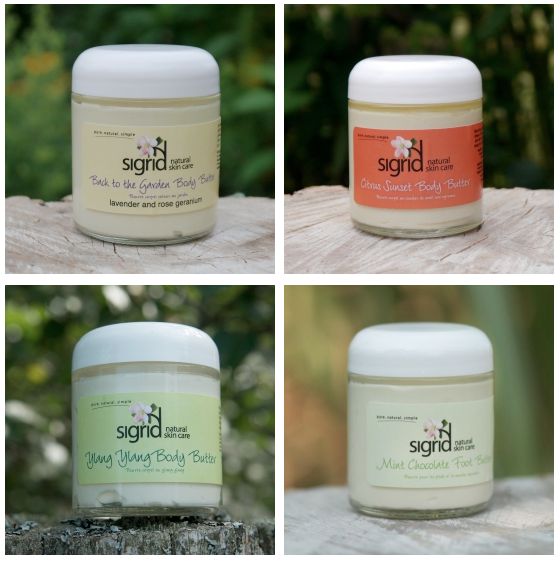 @SigridNaturals Use of natural herbs in your products? Wow that's cool! Love the natural herbs used here.